Stumbling over more than thirty years, "Chinese medicine law" in July 1, 2017 formally implemented. This law is the first time that China has clarified the important status, development guidelines and supporting measures of traditional Chinese medicine from a legal perspective and has provided legal protection for the development of Chinese medicine. So far, "Chinese Medicine Law" has been implemented more than in March, the Chinese medicine industry what new moves, new changes? It is understood that China's largest drug-based manufacturing base of Guangzhou Pharmaceutical Group pioneered the "broad-drug program" - to create "fashion medicine", planned through advanced technology and fashion marketing, so that Chinese medicine "boom" up. Prior to the Tenth China Bioindustries Conference and the first official forum for the International Community of Animals, which attracted the attention of the industry, GPHL launched the major national special project of good science and technology - "Research and Development of Classic Famous Parties Based on the Uniformity of Party Responsibilities" , And held a "to create fashionable Chinese medicine" advocacy ceremony to lead the technological innovation of traditional Chinese medicine industry, by the participating experts and scholars, the relevant government departments and associations concerned about the leadership and recognition. As one of the largest manufacturing bases for proprietary Chinese medicines, GPHL owns 12 old Chinese brands and 10 history over 100 years. Among them, Guangzhou Baiyun Mountain Ming Hing Pharmaceutical Co., Ltd. was founded in 1900, a century of ancient Mingxing Xing Qing Kai Ling is the ancient plague Fangangniu Niuhuang Wan modern preparations, Qing Kailing oral solution, capsules, granules and other dosage forms , Is the new use of ancient medicine, "fashion medicine" on behalf of. Mingxing Qing Kailing as the heat and antidote medicine developed from the ancient Wenbi Sambo "Angong Niuhuang Wan", the group of honeysuckle, Scutellaria, Gardenia, Banlan root has a strong broad-spectrum anti-virus, antibacterial activity, animal Cholic acid, buffalo horn and mother of pearl have a good anti-inflammatory and anti-inflammatory and improve the role of human immunity. These eight herbs in strict accordance with traditional Chinese medicine, "Jun, Chen, Zuo, so" principle of the group, scientific compatibility. After composing compound, its antiviral, bacteriostatic and antipyretic anti-inflammatory effects can complement and synergize with each other and can prevent and treat all kinds of viruses (hot and poisonous viruses) and influenza, upper respiratory tract infection and hand-foot-mouth virus infection. Science and technology are the core competitiveness of fashion medicine, Ming Hing Pharmaceutical adhere to continuously improve product technology gold content. Prior to the Tenth China Bioindustry Conference and the first official forum for the International Community of Organisms, GPHL launched the national major science and technology project "based on the party's consistent evaluation of the classic technology side of the research and development," Ming Hing Pharmaceutical is also involved . 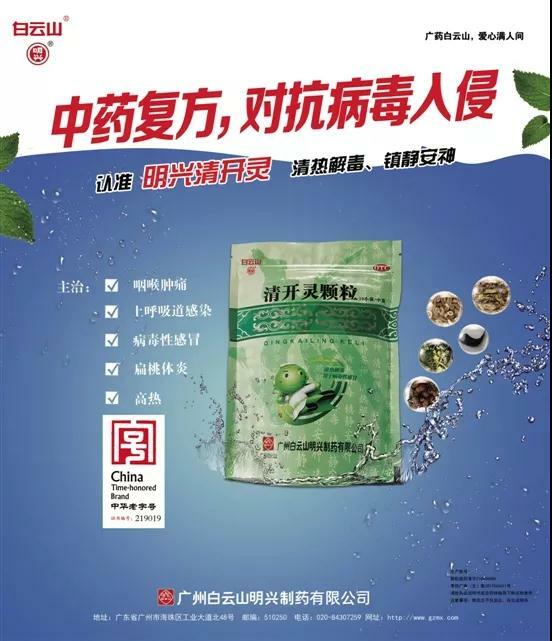 The subject by the Guangzhou Pharmaceutical Group, led by the joint 13 units, bringing together the 14 most original and development prospects of the classic side as the research object, strictly follow the ancient prescriptions, the original amount, follow the ancient traditional system of law, preparation of standard decoction , Build a traceable internal control program through quality, standard and control research from the source to the finished product, build a platform for the consistency assessment based on the "overall quality features" of the traditional system of law, Side development of key technologies, to carry out safety, the main efficacy or systematic biological evaluation, in order to achieve clinical accurate positioning, and ultimately obtain the production license or new drug certificate. Through this research, we will solve the key core issues that restrict the R & D by the R & D parties, form a series of guiding principles, promote the process of simplifying the registration process for the classic names and provide demonstration for the development of classic names. Through the integration of strong scientific and technological resources, including Mingxing Qing Kailing, GPHL's famous proprietary Chinese medicines to achieve innovation and development. Li Chuyuan, party secretary and chairman of GPHL, said that under the drive of TCM sector, GPHL has been growing at an average annual growth rate of 20% or so from 50 billion yuan in 2013 to 100 billion yuan this year Yuan, with four years to achieve sales doubled for the "fashion medicine" to create a good foundation for further development. The ultimate goal of "Fashionable Chinese Medicine" is to create products most needed by the general public now and carry forward the traditional Chinese medicine technique. Although Mingxing Qingkailing is originated from Fang'an Gong Niuhuang Pill whose name is ancient plague, it has developed many modern dosage forms such as Qingkailing oral liquid, capsule and granule, which can be taken as a representative of "fashionable traditional Chinese medicine". It is reported that Mingxing Qingkailing with the overall regulation of multi-target characteristics of the summer on the lit, sore throat has a significant effect. Mingxing Qingkailing not only antipyretic anti-virus, but also has the role of improving the body's immune function, prevention and control of viruses, bacteria invasion. Qingkailing has remarkable curative effect on known or variant viruses and is not prone to drug resistance. In the past outbreaks of infectious diseases such as SARS, hand-foot-mouth disease, human bird flu, Influenza A (H1N1) virus and even the newly released H7N9 bird Flu, etc., have played a preventive role, recommended by experts and social affirmation. Qingkailing injection has also been designated by the State Administration of Traditional Chinese Medicine Hospital of Traditional Chinese Medicine Emergency Room (room) essential proprietary varieties. Li Chuyuan said that in the future, GPHL will continue its efforts in the old-time protection, inheritance, innovation and development to create fashionable Chinese medicine and provide more power for GPHL to sprint the world's top 500 enterprises. Chinese medicine industry has become the country's new economic growth point. Data show that in 2016, China's total output value of Chinese medicine industry more than 800 billion yuan, accounting for nearly 1/3 the scale of the pharmaceutical industry, the market has great potential for development. It is reported that Guangzhou Pharmaceutical Group "Thirteen Five" planning goal is to sprint the world's top 500 by 2020, of which Guangzhou Pharmaceutical Group is one of the core strengths of the Southern medicine business segment. In the next few years, GPHL will lead the innovation and development of its traditional Chinese medicine with the concept of "fashionable Chinese medicine". In particular, GPHL will speed up the "four modernizations" of traditional Chinese medicine, namely modernizing, internationalizing, popularizing and popularizing traditional Chinese medicines. The official responsible for Ming Hing Pharmaceutical said that under the leadership of GPHL's "Fashionable Chinese Medicine" strategy, Ming Hing will continue to introduce such fashionable elements as "young", "taste", "technology" and "quality" Products, while using the new media and means to popularize the knowledge of Chinese medicine in young consumer groups, the dissemination of traditional Chinese medicine culture, the product well, the culture of succession, I believe "fashionable Chinese medicine" promising.